Talk about a sinfully delicious treat that won’t give you a muffin top! 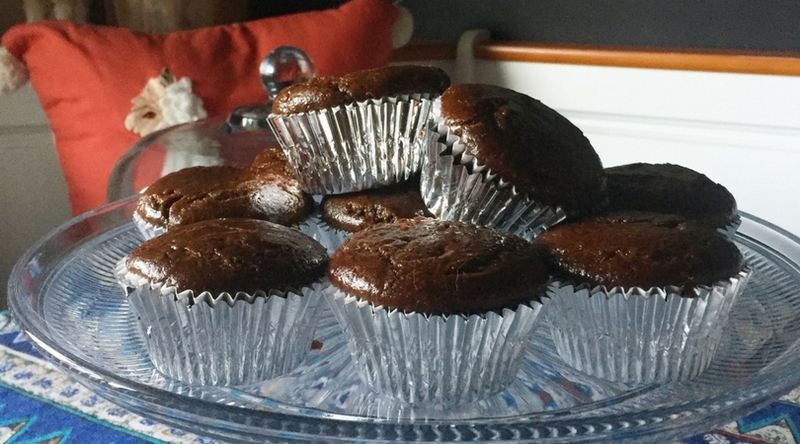 I actually altered my chocolate cupcake recipe to make these and they turned out so well. It’s amazing what you can come up with when you have overripe bananas sitting on your counter. I have a stand mixer, so I started by creaming the bananas and sugar together. Then I added in everything else and had it whisk until smooth. Probably frowned upon by actual bakers, but it worked. Pre-heat your oven to 350 degrees and bake these in a muffin tin for 25 minutes. Let cool. I really loved how ooey, gooey moist they were. Almost like the texture of a honey-bran muffin. The banana works as a great binder and the flavor isn’t overwhelming. I would like to try making these with a nut milk instead of coffee and subbing out some of the flour for almond meal. I’ll play around with that! The next time on my baking agenda is Chai Spiced Pumpkin Vegan Muffins. Check back in the next few weeks for that recipe. Interested in vegan baking? Check out some of these cookbooks!